Is Coke on sale? Stock up so you can always make Coca-Cola Cake! Coca-Cola cake is a southern specialty; just don’t try it with Diet Coke. In the world of baked desserts, there is a special category of scrumptious delights made by simply throwing together things you always have on hand. Pound cake is one of these (pound of butter, pound of sugar, pound of flour); for me, the Joy of Cooking Vegan Chocolate Cake is another (cocoa, flour, oil, etc. all mix in a single bowl). After a recent visit to North Carolina, I’ve learned that Coca-Cola cake is another of these anytime-cake basics. 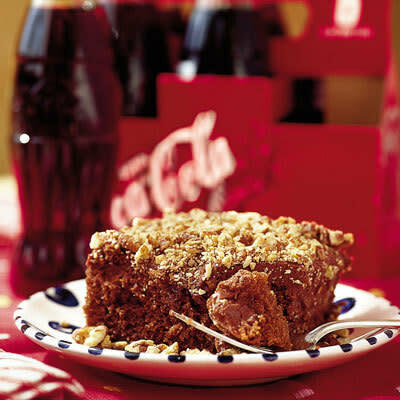 Coca-Cola cake is also a welcome reminder of regional differences across our country, because this recipe figures that a southern kitchen will always have a supply of Coke in the cupboard. After all, many a Southerner is known to start the day with a can of Coke, and the world headquarters are in Atlanta. The cake also assumes a bag of mini-marshmallows; I suppose Southerners are always ready with gooey sugary treats? That part of the country is the land of Goo-Goo Clusters (Nashville) and Little Debbie (she’s got roots all over the south). The cup of Coke in the cake ensures it’s extra moist, and imparts a rooty tang to the mild cocoa flavor. Coke is also used in the glazed icing, which you just pour on top of the baked cake while it’s still in the pan. I had my first taste of Coca-Cola cake at a recent wedding reception in Charlotte, NC. Two sisters, daughters of a minister, had grown up eating their fair share of church dinners – and desserts. When both sisters happened to get married within a week of each other, they came home and threw a special party for the congregation that had watched them grow up. Their only culinary requests: Coca-Cola cake (well, and Vada’s chocolate cake, but evidently Vada doesn’t give out the recipe to that favorite). As with many recipes for old school, whatever-you-have-on-hand desserts, there are slight variations on the Coca-Cola cake. Here’s the official version from the Coca-Cola company’s website. Interestingly, they call it just "Cola Cake," despite the fact that just about every other reference I saw calls it by its official, brand name. pecans. Spread over hot cake. When cool, cut into squares and serve. *The cake recipe was contributed by Lee Avery Catts to "Atlanta Cooknotes"
published by The Junior League of Atlanta. Notes: one trick to the cake seems to be to make sure to bring the liquid mixture (the butter, Coke, etc.) to a boil, so that it will melt the marshmallows when they all mix together. Also, if by chance you have no buttermilk on hand, add a touch of lemon juice to regular milk and use that instead. You just need that bit of acid to react with the flour – which also means that the cake should be made all at once, not let to sit before baking!